So many roadblocks can put a screeching halt to a genealogist’s quest to find his or her lineage. The disheartening fact that the records do not exist can often be a turning point. While such matters can put a damper on your research efforts, exploring resources in unfamiliar territory is often a source of hope. Vastly different records can be found in the numerous databases that exist and can be very helpful in providing clues to put the genealogy puzzle pieces in place. The Indiana State Library provides access to numerous databases that serve as rich resources and sometimes provide much needed information. Take, for instance, the Freedman’s Bank Records collection on HeritageQuest. Experienced genealogists realize that a lack of records is not uncommon and even more so when conducting African American genealogical research. The scarcity of antebellum African American records can make those ancestors extremely difficult to research. So, if you are able to find something in the Freedman’s Bank records, you’ve likely found some information valuable in your never-ending search for your long-lost ancestors. 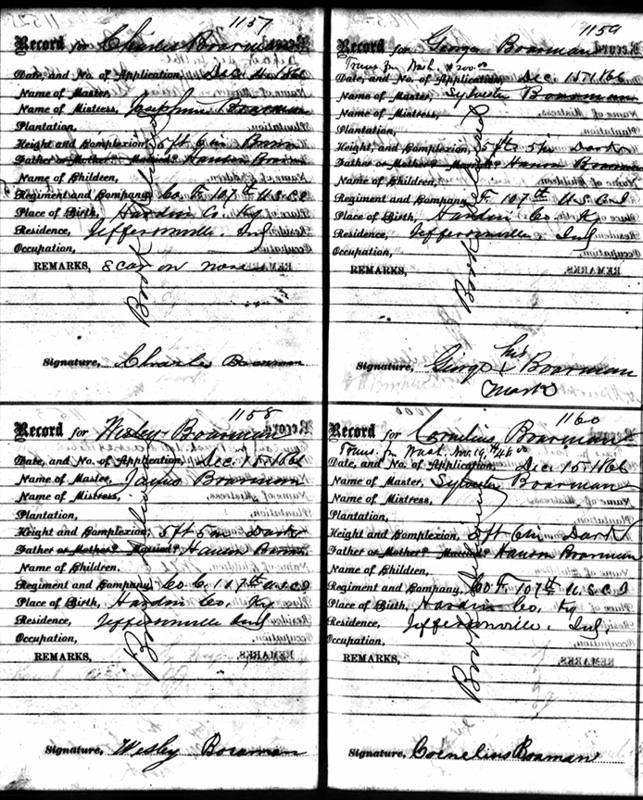 A quick glance at the records found in the Freedman’s Bank collection for the Boarman brothers, Charles, George, Wesley and Cornelius (who eventually found their homes in Jeffersonville, Indiana), provides a great deal of information all in one place. You are able to link four brothers, find their place of birth, as well as their father’s name, in addition to the fact that they each served in the 107th Regiment of the United States Colored Infantry. All of these clues are the types of clues that allow you to delve even deeper into your research. Ancestry.com. Freedman’s Bank Records, 1865-1871 [database on-line]. Provo, UT, USA: Ancestry.com Operations Inc., 2005. HeritageQuest is one of many databases accessible in-house when you visit the Indiana State Library, while some databases can even be accessed from the comfort of your own home or your local library. To explore our online resources, please visit the online resources page on our website; or, even better, visit us in person! This entry was posted in Genealogy and tagged Genealogy, HeritageQuest, History, Indiana, Indiana State Library, Online Resources by indianastatelibrary. Bookmark the permalink.